# 2005 October 5 comments halloween holiday photos . Zappa is not named for the great Frank Zappa, or at least not directly. Frank rather quixotically named his daughter “Moon Unit”, and Mike Myers used this in Austin Powers 2: there is a scene where Dr. Evil talks about how he has divided his moon base into “Moon Unit Alpha” and “Moon Unit Zappa”. I had just finished reading a book by Bruce Pandolfini, “Chess Openings: Traps and Zaps”, and I thought that Zappa had a nice sound to it. I have never actually listened to a single song of Frank, although I am quite fond of several of his quotes. # 2005 October 3 comments No hashtags. # 2005 October Zero comments memories web-programming . # 2005 October Zero comments memories . I’m a big fan of Halloween. In 1991 or so I won a costume college (I was either first or second place out of maybe 2 dozen or so health science students at CHRV College of Health Sciences). 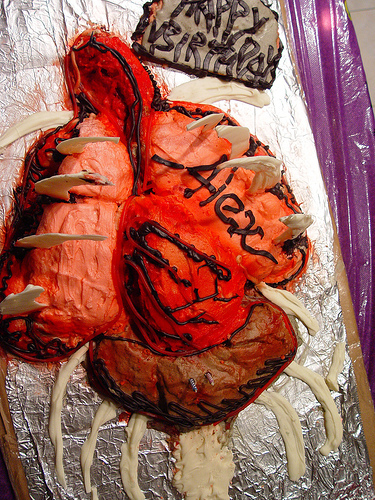 The other day I posted the “guts cake,” which I submit as evidence of liking Halloween. Funny enough, I’m not a big fan of scary movies. I don’t really care for horror movies unless MST3K is making fun of them. I did like _Shaun of the Dead_, but in general, not so much. 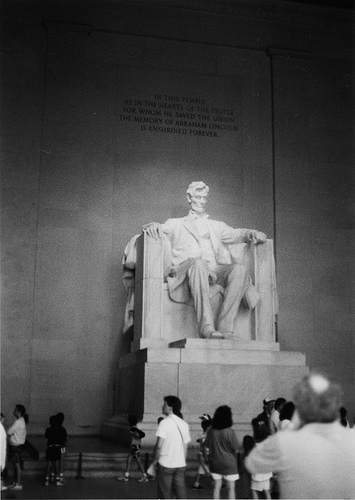 The image above is a bad colorization of a scan from a college yearbook. 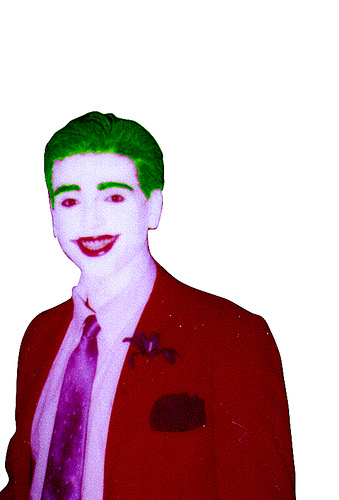 The yearbook is from 1991, the colorization was me doing PhotoShop for a class at UCLA Extension in 1995. It’s not great colorization. These days I’m much better. Today was not so great. Plenty busy all around, feeling choked by work. Let me say that Leah rocks my socks off. She’s on the verge of being the best project manager I ever worked with _ever_. And I’ve worked with some great ones. Also terrible ones. _Terrible_ ones. # 2005 October One comment cosplay memories photos . This wonderful set of posts deflates “Web 2.0 Hype™”, reinforces the awesomeness of those folks (like EVDB) who are working to remake the web to actually *use* these wonderful syndication tools and browser technologies to the fullest extent: Part I, Part II. _Backstory:_ I’ve actually met both Andy Baio (briefly) and Brian Dear (less briefly, we had lunch once. Smart fellow and a nice guy.) and have read them for a while. I think both Upcoming and EVDB are kickass tech. And if you hadn’t noticed, this post was for geeks. # 2005 October 2 comments web-programming . # 2005 October Zero comments memories photos . Chicken suits on _Lost_ and _The West Wing_. Mentions of Grand Guignol on both robotwisdom and _The West Wing_. Ice cream in my hand and on _The West Wing_ within 10 minutes. If I were a tinfoil hat wearer I’d say that TWW were trying to send me a message over the past three days. # 2005 October Zero comments No hashtags. And I played around with these experimental photos after scanning them into PhotoShop. If you’re counting, that means I have TEN years of experience in PhotoShop. I love the Cove very much. It feels like I still have much to learn, still. # 2005 October 2 comments memories photos . A list I kept of stuff I liked. Why? Don’t ask me! I’m the 35 year old version of me. Now I do this sort of stuff on the website. Heck, why am I posting this here? # 2005 October Zero comments memories star-trek . Lovely day today. Swap Meet in Goleta (just outside Santa Barbara), then a trip to Fry’s in Oxnard. Lovely day. It’s raining like a big dog out here. Last night we had a flash flood of ants show up in the kitchen. Literally, one minute, no ants, and 10 minutes later they were making a beeline for the potted plants on the bartop above the sink. Wait, can ants make a beeline? Anyway, we dispatched the ants tout suite. We keep getting eruptions of ants, for a while we had them coming up through the drain in the dishwasher! We poured vinegar down there, then later bleach, then more soap. Eventually they stopped. We’re pretty much sick of the ants. Though it could be worse — namely — mice or roaches. I suppose we’re lucky with regard to varmints. But it’s raining again, I think it rained all night. It’s nice, though a bit chilly. Busy lately. Not enough sleep. But things are pretty good. I should have news soon on some things. Not much news for now though. ASP.net, disgruntled clients, ungruntled clients, flooding, Blue Angels overhead, trips to hairdresser, ants that come and go, trashcans that need bringing in, job resignation, new free metal desk, SQL Server, OO PHP4, shopping carts, new MySQL databases, exporting JPEGs, lack of a whiteboard, couch-sleeping. It’s a good day, but another busy one. # 2005 October Zero comments web-programming . The first complete artist catalog released on DualDisc! This specially packed boxed set contains all eight of Talking Heads’ studio albums, expanded and remastered as two-sided DualDiscs featuring audiophile DVD-A sound, rare and previously unreleased material, and video tracks. Packaging includes an outer white molded plastic box with raised song titles, housing eight individually packaged white jewel cases, each containing liner notes, rare photos, and song-inspired art pieces. Formed in New York in the mid-’70s by David Byrne, Chris Franz, Tina Weymouth, and ex-Modern Lover Jerry Harrison, Talking Heads transcended their humble CBGB beginnings to become one of the most adventurous and influential bands of all time. Their visionary, polyrhythmic stew combined funk and punk with African beats, avant-garde minimalism, and pure pop. From their 1977 debut to their Brian Eno-produced classics to their 1988 swan song, Naked, Talking Heads consistently pushed creative boundaries while delivering smart radio hits like “Once In A Lifetime,” “Burning Down The House,” and “Wild Wild Life.” In 2002 the band was inducted into the Rock and Roll Hall of Fame. I have no idea how I would even play a DVD-A. But that’s definitely something I’d like to have in the distant future. Real distant. I just love that I can get all the Steely Dan lyrics I want from SteelyDan.com. You sure have changed since yesterday. Have a great day, you. # 2005 October Zero comments lyrics music steely-dan .